This genus is accepted, and its native range is Mexico to Tropical America, W. Central Tropical Africa to Sudan. Perennial. Culms prostrate; 10-30 cm long; spongy; rooting from lower nodes. Ligule a ciliolate membrane. Inflorescence composed of racemes; embraced at base by subtending leaf. Racemes borne along a central axis; unilateral. Rhachis angular. Spikelets appressed; in pairs, or in threes. Fertile spikelets pedicelled; 2-3 in the cluster. Pedicels filiform. Spikelets comprising 1 basal sterile florets; 1 fertile florets; without rhachilla extension. Spikelets lanceolate; dorsally compressed; 7-8.5 mm long; falling entire. Glumes reaching apex of florets; thinner than fertile lemma. Lower glume oblate; hyaline; without keels; 0-2 -veined. Lower glume lateral veins absent, or obscure. Lower glume apex obtuse. Upper glume lanceolate; membranous; without keels; 7-9 -veined. Upper glume surface scabrous. Upper glume apex acuminate. Basal sterile florets barren; without significant palea. 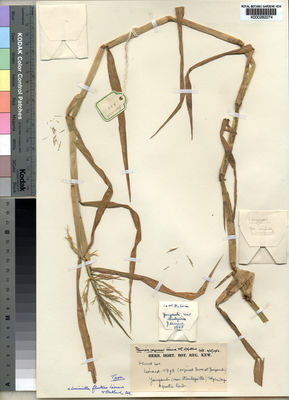 Lemma of lower sterile floret lanceolate; membranous; 7-9 -veined; acuminate. Fertile lemma ovate; coriaceous; much thinner on margins; without keel; 7 -veined. Lemma margins involute. Lemma apex acute; pubescent. Palea coriaceous. Caryopsis with adherent pericarp; oblong; dorsally compressed; plano-convex. Embryo 0.3 length of caryopsis. Hilum linear; 1 length of caryopsis.